In the future, no longer will athletic competitions be focused on physical prowess. Rather, they will be focused on proper planning and strategies within the minds of only two single human opponents in conflict. In the future, there will be no need for an all-star lineup of Tom Bradys or Peyton Mannings, as robotic beings will be able to recreate their best plays with the click of a button. In the future, everything will be blue, shiny and covered in chrome. All this and more will soon become a reality… or at the very least, this is what Mode7, the creative minds behind their newest title “Frozen Endzone” has in mind for the future of sports. After the success of their highly-rated tactical strategy game “Frozen Synapse”, they’re now looking to bring the same brand of tactical strategy goodness into a futuristic age with a cyber-football theme. 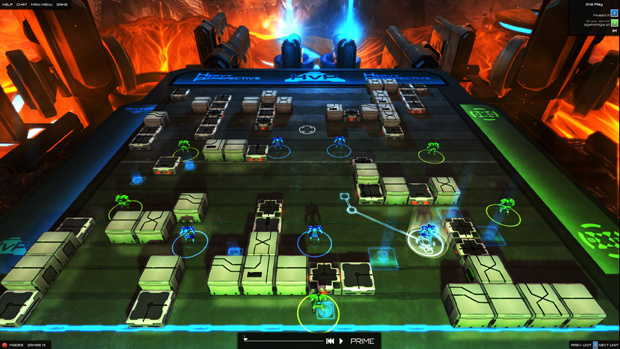 While Frozen Endzone is not considered to be a direct sequel to Frozen Synapse, it promises to be just as addictive. Personally speaking, since I am not too big on sports or tactical/strategy games, putting both of these things together would have resulted in a disastrous mix, but after several days on that chrome covered pitch, the experience went a lot better for me than expected as the core gameplay is easy enough for anyone to jump into. When I started the game up for the first time, I instantly went straight for the tutorial, because with my limited experience with tactical/strategy games, I sure as hell didn’t want to make a complete fool of myself in this strange world filled with android football warriors. The tutorial goes over all the aspects of the game, including controls, passing, running and blocking. Each mechanic is explained in fairly brief detail, so learning the basics wasn’t as overwhelming as I thought it would be. And as if a playable tutorial wasn’t enough, they also have tutorial videos as well, so whether you’re a player that likes to watch demonstrations or go hands-on, you’ll be making plays and scoring goals in no time. However, getting used to all the mechanics still took me awhile to grasp. At the end of the tutorial, the game challenges the player to complete a touchdown against the AI, sort of like a final lesson to really show if you’ve gotten the mechanics down, and I decided to replay that tutorial several times before getting started with a regular match. While I still wasn’t feeling up to playing against live opponents, the game offered a few AI challenges. With each match, the game forms a randomly generated map that offensive players must learn to use to their advantage, as two different kinds of blocks will be place all over the pitch: High blocks that players cannot pass through and low blocks that players can pass the ball over. Moving your teammates around the pitch is as easy as pointing and clicking a spot on the map. Once those spots have been placed, players are free to tweak the placement of those spots until they’re as perfect as can be. Players can also adjust the time it takes for each teammate to reach a spot, either to give other teammates some time to move into position for blocks or passes. Once the player has their team’s positioning all set, they can confirm their play and watch the outcome through a live reply, courtesy of the Endzone Sports Networks. Of course, it isn’t enough just to make a play and expect it to work as intended, as enemy robots will have a specific AoE range to block, chase ball handlers or intercept passes. 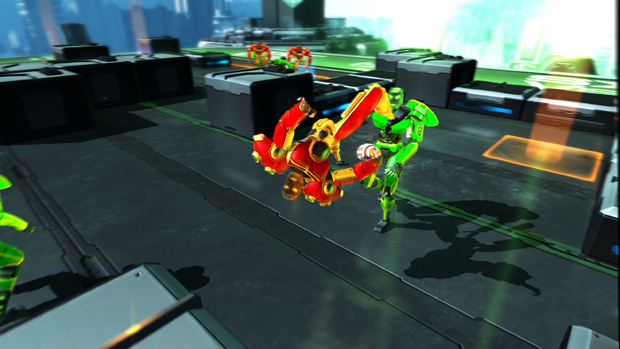 In order to prepare for such moments, players can actually select their opponent’s robots during their planning phase and set their movement positions on the pitch, so it’s possible to set up various “What-if” scenarios to see what play will work out the best. It took me a few tries to grasp all the possible options I had during a single planning phase, but once I did and was able to score my first touchdown, it was the best feeling ever. 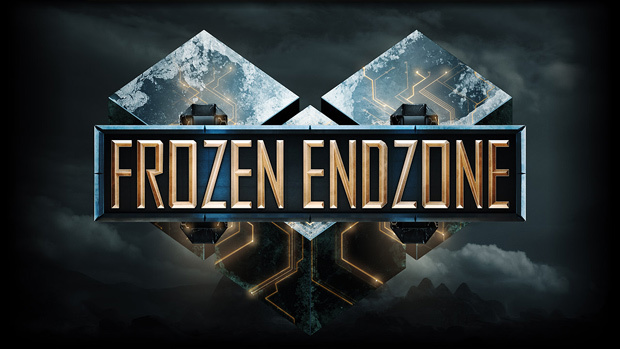 The futuristic aesthetic that Mode7 has created for Frozen Endzone is like a weird mix between TRON and Monday Night Combat, and when I mean weird, I mean totally awesome. 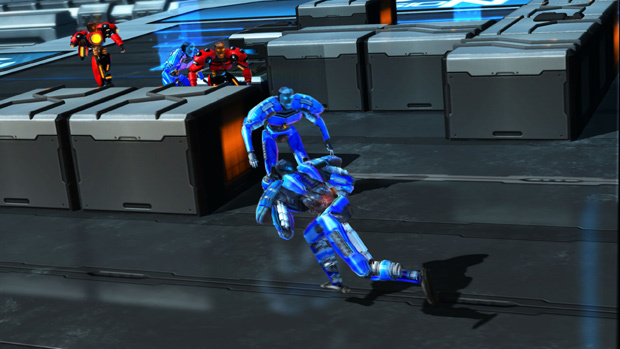 With each instant replay after every planning phase, the camera angle swings in very close in order to highlight all the swift animations, crushing tackles and eerie expressions on each of the robotic players. Now all they need to add is the option to choose your own funky end zone dance and this game will be golden. However, what really pulls the whole futuristic vibe together is the glorious trance and electronica soundtrack created by nervous_testpilot. Each and every song created for this game drives a chilling hook into your ears, and overall it makes the whole “Frozen” part of Frozen Endzone come alive. It’s easily one of the best original soundtracks I’ve listened to this year, and will possibly have a cozy spot reserved in my own music collection. So after a couple of days just playing against the AI, I felt that I was sort of, kind of ready to take on some live opponents. Even though I felt like my plays were still pretty crappy, I figured I’d take my licks by enrollment into the school of hard knocks and simply learn from my mistakes against others. So the way multiplayer works in Frozen Endzone is that players can either throw themselves into a queue for other active players or search for players online and invite them to a private match. The type of matches that players can queue up for includes Endzone, Handball and One Play. Once a match against a live player has started, I was surprised to find out that there is no time limit during a planning phase, so each player will be free to carefully plan out every move and position before submitting their turn, whether they’re on offense or defense. This means it’s quite possible that a single turn for one match can last several hours if both players are really into it. Of course, if a player does end up completing their planning phase before their opponent, it can be a bit boring having to wait for the phase to start, so why not start another match while you wait for your other opponent to finish their turn? Well, that’s the beauty of playing a turn-based strategy game like Frozen Endzone: Players can compete against other opponents in multiple matches at the same time. At one point when I threw myself into the queue line for public matches, I was playing against three different opponents in each game mode, all at once. Sadly, I lost all three of those match-ups. My tactical gaming skills could barely handle one opponent, so it was silly of me to think I could handle three! As my Frozen Endzone experience comes to a close, the whole thing helped me gain a better appreciation for tactical/strategy games as a whole. With the promise of more modes, team customization, season matchmaking options and more in the full release, there’s a lot for Mode7 fans and football fans to take in. And overall, I simply must say that it makes me look forward to how sports will truly be like in the future.